Those little Estes rockets you built as a kid just got blown out of the water. In response to the Carmack Prize to launch an amateur rocket above 100,000 feet, [Derek Deville] and the rest of the Qu8k team launched a 320 pound, 14-foot-long rocket through 99% of the Earth’s atmosphere. Unlike our little toy rockets from years ago, more than half of the entire rocket is fuel. This isn’t a plastic or salami-powered hybrid rocket, though. It’s an entirely solid fuel rocket. The fuel grain is specially made for this rocket in a cylinder-with-fins shape that ensures an even burn through the entire flight. 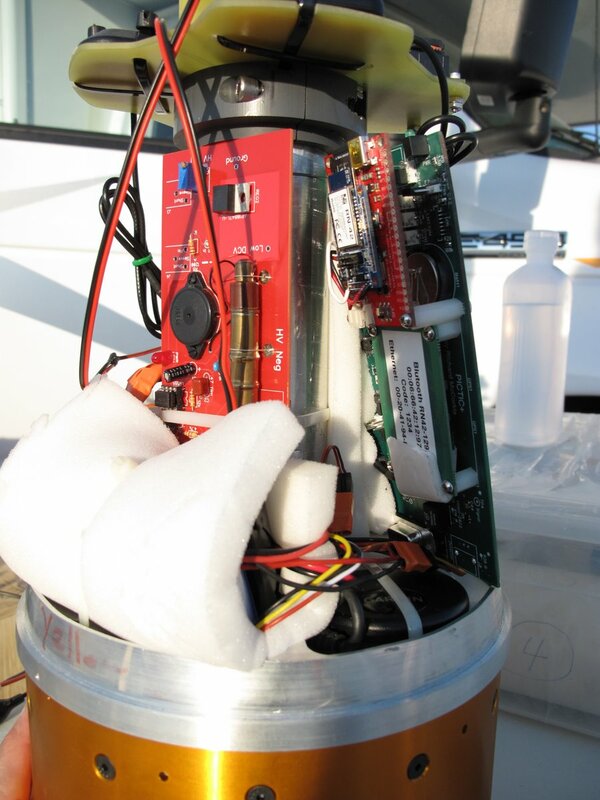 The payload included 2 timers, an accelerometer, a cosmic ray detector (check out the Geiger tube) and 4 GPS units required of the Carmack Prize. 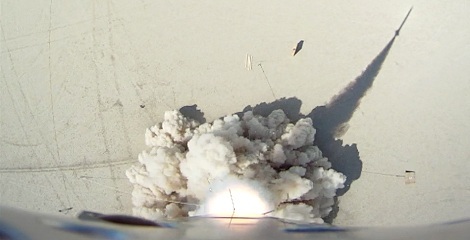 The video from the on-board camera shows a fantastic flight, only partially obscured by the plastic aeroshroud that melted when the rocket was going about Mach 3. Videos of the entire flight and a ‘highlights’ reel are available after the break. I’m going to imagine there’s some kind of cool inspirational October-Sky-style back story here. Totally awesome!! Congratulations on a perfect flight!! How much did something like this cost? That is absolutely INSANE. I’m speechless. That looks really professional and the amount of design and planning that had to go into that several minutes of flight had to be enormous. And the money, coworker is guessing somewhere over $7000 of propellant used in there. That might just be one of the coolest things I’ve ever seen. Take off reminded me so much of a SAM launching. Wow, just wow. Would love to see a vid with the telemetry data super imposed. 99% of the diametrical thickness of the Earth’s atmosphere, which is to say, 99% of the distance between defined sea level and the defined point at which Earth’s atmosphere ceases. Haha. Is that the Troposphere, Stratosphere, Mesosphere, Thermosphere? I can’t reply to your other post due to nesting limits, but the rocket went into the thermosphere (which starts at 80km). Not quite– they went 120,000 ft, not 120,000 m. They made it to about 36 km, putting them in the mid-stratosphere. I imagined it was by total atmospheric mass – since once you get up high there’s plenty of linear distance before the end of the atmosphere, but almost all of the mass of the atmosphere is beneath you (in the spherical shell beneath you, that is). But I imagined that because I know thats the most impressive sounding metric, and its the best way to make something sound better. Perhaps this was such a badass achievement they didn’t need any fluffy verbiage to make it sound better. Wow, that’s incredible! The clarity of the HD cameras just makes it so… stunning, I guess. Major props to these guys. That must have been a massive undertaking, and the results of it are nothing short of incredible. The speed on that, though… wow. Goddard barely even got close to mach 1… these guys just blew past it and kept on going. Very well built, well executed, and well documented. This is an impressive project, but Robert Goddard was probably quite familiar with similar rockets, having used solid rockets in his work on rocket nozzles. 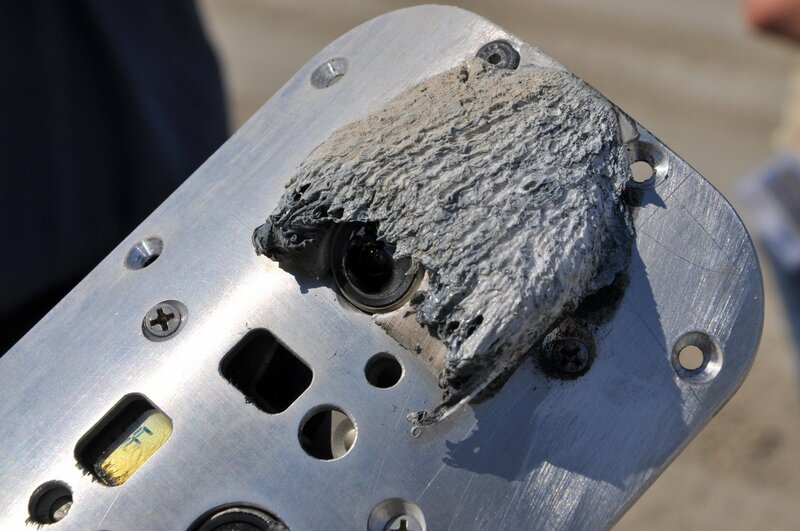 He started working with liquid fueled rockets because of the limitations of solid fuel rockets like this one. 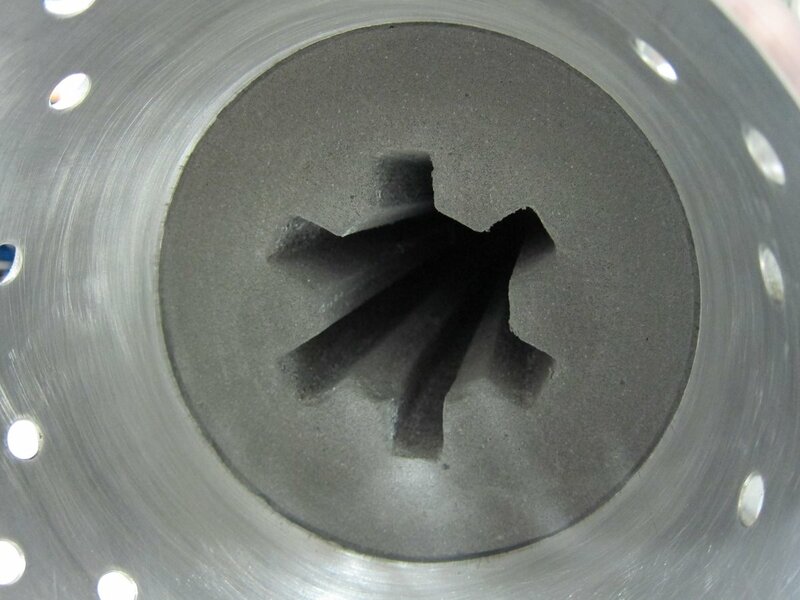 It’s easy to get large amounts of thrust out of a solid rocket, but solid fuels can not come close to the efficiency of liquid fuels. Goddard’s work was largely centered around the engines and control of the vehicle…he unfortunately severely lacked funding for building large rockets for most of his career. The cameras, GPS, etc though…that would have impressed him. Or even just the simplest of the electronics…control was a problem in early rockets, often using mechanical timers and such that caused all sorts of problems. James Van Allen came up with a true hack in the 1950s when his balloon-lofted sounding rockets kept failing to fire…he figured the cold was causing the clockwork timers to freeze up, so he put heated-up cans of orange juice in the gondola and wrapped it with insulation…blankets, IIRC. Gorgeous! Beautiful! This was a dream of mine while I was still in middle school. To see that it is actually possible to do it with a homemade rocket makes me feel all warm inside. Disregarding wind resistance and mass changes due to fuel mass loss, a 1200 pound car would be accelerated in about 2.5 seconds to about 720 mph in a quarter mile. Wind resistance is probably pretty stiff though, so it would probably take a bit longer than 2.5 seconds to actually get up to those speeds. Also, most cars aren’t really designed for the sorts of wind loads that near-mach travel presents or for 13g acceleration, so you may encounter some, ah, call them ‘structural integrity deficiencies’ very shortly after ignition. That’s why you build it into a Delorean. The stainless steel body has a beneficial effect on the flux dispersal. 2 motors should be capable of 300+mph, low 4 / high 3 second passes over the standing quarter – should be enough to take the current record of 386mph in 3.5 seconds set by Sammy Miller with a Hydrogen Peroxide rocket car. awesome stuff, how far is outer space from there?? About a third of the way– 120 kft = 36 km. Space is typically considered to start at 100 km. X-15 pilots got their astronaut wings for flying above 50 miles (264,000 feet). After a lot of pointless contraptions that people make “because they can”, I’m glad I keep on checking HaD to see this gem: simply amazing, congrats to all those involved! No, it is awesome because it is a “nobody else could” moment. I was expecting all kinds of shaky video, dropouts, bad sound and ultimately a disappointing end. None of those things are present in this video. Absolutely wonderful to behold. This really gives you a feel for how tiny our planet is and also how beautiful. An amazing achievement – something to tell the grandkids about for sure. Too bad people like Von Braun and Goddard were not around to see stuff like this. They would have been thoroughly impressed also. in today’s day in age with terrorism on everyone’s mind you probably need some serious permits to use the rocket. Thanks to people like you pointing this stuff out, yes you probably do. Bloody wowsers and do gooders will destroy our hobby. If it scares you go elsewhere. This is a great example of what is possible with some fore thought and good engineering, Would love to see a multistage capable of getting a payload to orbit…..
Just a FAA altitude waiver. Chances of you actually hitting something are astronomical. Even on the way down? This was extremely entertaining to watch. What an accomplishment. The next time he should lift the launch platform to near 100,000 ft using some sort of weather balloon array and then launch the rocket. Ignoring the logistics of having a successful launch, perhaps space would then be attainable.. I wanna see someone do it even with a “toy” model rocket. All sounds fine and dandy, but in a rarefied or non-existent atmosphere, rocket stabilization becomes a bit more problematic since fins do little to no good for rocket stabilization. So you’re left with either vectored thrust (or vectoring jets) or some sort of gyroscopic stabilization. Neither of which is non-trivial. The only diff between that rocket (going a mile up) and one going 22 miles up is thrust:weight ratio (more oompf) and burn time. Burn long enough with at least a 5:1 ratio and you’ll eventually pass mach and get way up there. Where was the launch site? It looks like the dry lake bed between Las vegas and Searchlight Nevada. My first thought was Utah once I saw the lake, maybe I’m wrong. This was launched at the BALLS20 event in the Black Rock Desert in Nevada (same place they hold Burning Man). Very cool, excellent engineering work indeed! And was that APRS they were using to locate the rocket afterward? It landed only 3 miles from the launch site! Unbelievably good! When I was a kid, my Estes rockets would fly 500 ft up and a mile out! I lost more than I retrieved. WOW! Got a ton of attention in the shop tonight with this video. How much did that motor cost and who built it? Thanks for posting this! Kerbal space center anyone ? Why the camera shield melted was because they ran out of time to make a cast metal version so they put the 3D printed plastic one on. I would’ve just said, “Give me a ball peen hammer, a piece of sheet metal, a small anvil and a drill.” and banged out a usable shield in a few minutes, with holes to attach it using the same fasteners their fancy part was planned to use.